42 Technology has helped Linde Gases, a division of The Linde Group, to design and develop a new easy-to-use industrial gas cylinder valve with integrated pressure regulator. The new EVOS VIPR valve has been specifically designed to offer ‘best in class’ accuracy and consistency of output gas flow rates or pressures, while at the same time incorporating all of Linde’s existing EVOS family safety and performance features. Linde’s new EVOS VIPR valve features an innovative geared outlet setting indicator (shown on the left) so users can ‘dial in’ their required settings before opening the valve with the central lever. The new pressure regulator elements used within EVOS VIPR have been designed to maintain highly accurate and reliable control of output flow rates. As a result, there is no need for users to adjust flow settings even during long-term use as the cylinder pressure drops, they can simply ‘set and forget’, whereas most competitive valves can drift by up to 50 per cent. The new valve also features an innovative geared outlet setting indicator that enables users to quickly and easily set their required gas output conditions before opening the valve. The valve is then opened using a unique quick action lever which is one of the technology breakthroughs first introduced in Linde’s award-winning EVOS Ci cylinder package. Linde Gases and 42 Technology first started working together in 2012 to develop the EVOS family of innovative industrial gas cylinder valves and packages, with EVOS VIPR now being the third product line to result from the partnership. The consultancy’s mechanical engineering skills, technology innovations and expertise in running multi-national projects have been invaluable, and our engineering teams are continuing to work together to further develop our market-winning range. – Chris Cowles, global design manager for packaged industrial gas valves at Linde Group. The three Linde EVOS VIPR valve variants include one for use with inert shielding gases for applications such as TIG welding. EVOS Ci was the first member of Linde’s new EVOS valve family to be developed in partnership with 42 Technology. The new valve and guard were launched in 2014, and then proceeded to secure two major industry awards recognising their advances in industrial gas cylinder safety, ergonomics and performance: a Red Dot – Product Design 2015 award, and an iF Design Award 2016 in the product design category. 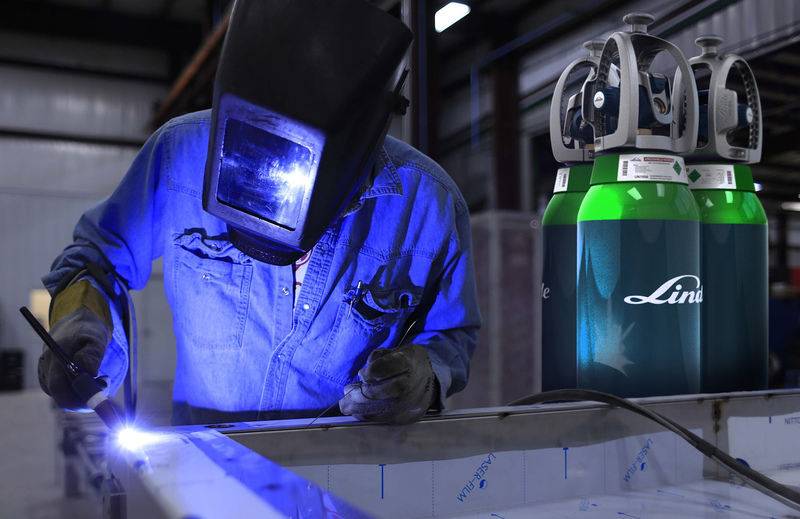 42 Technology has also helped develop EVOS DCi, an IoT digital valve for industrial gas cylinders – and another world first for the sector – that can regularly communicate details of its status, contents and location to nearby mobile devices, a company’s IT network and the Cloud.